Can anybody recommend a good resource for building a man trap in an urban house on a small lot, please? I found plenty of info about rural traps, such as rock slides, trail traps, and water traps, but no urban info. I’m trying to collect info on discreet weapons that are not firearms, knives, or clubs. I could be arrested for keeping a baseball bat and wasp spray inside my front door. Switch-blades are illegal. We are not allowed to discharge firearms within the city limits. The nearest practice range is 90 kilometres away. It would cost $3,000 for me to buy a long gun and get basic training, IF I could get a license. A handgun license is almost impossible to obtain. Any recommendations for alternatives much appreciated. Thanks. Ok you sound like your in a place like my brother and we are in canada. He lives in the city, I live in the country. What he is doing, is going with a high powered air rifle, just for scare tacs. Then a 150 lb draw Crossbow with broad heads on the bolts. Compound Bows are another option as well. All these let out very little sound as well. As for your Base ball bat problem, I have solved that as well. 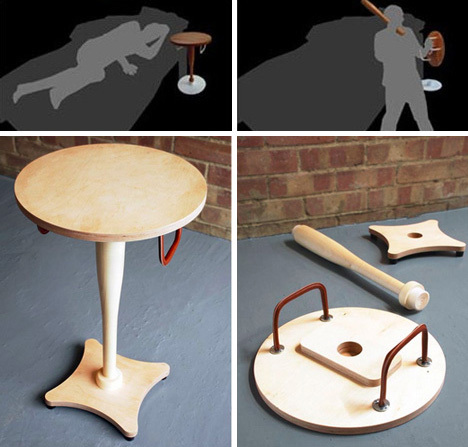 How about a nice piece of functioning furniture that has a hidden motive!! What about Black Powder, often much easier to obtain than regular firearms, or air guns maybe, some manstoppers out there in large calibers. A friend of mine has one,not suppose to as he is a felon. But there is no background checks for them either and he’s not on probation so….no visits from LEOs. I wouldn’t want to steer you into any trouble, just saying. I’m assuming that theres a reason that you can’t have a baseball bat in your home, so just be cool and keep whatever it is that you get well hidden , like buried or kept safely away till **** hits the fan, everyone that screws up is a result of being a showoff. I had another friend that kept a pistol in his pickup,Never a problem until his tags expired. He got pulled over and out of the blue the cop asked if he could search the vehicle. To my knowledge, he never got his gun back. Back to the mantraps, well the best of the best are Vietnam era. Good luck to you Patjoe. Yes, we’re in Canada, too. LOL! You could tell immediately by the stupid regulations. Those are brilliant, low-cost suggestions, all available from Crappy Tire. Merci beaucoup! Wow Gypsy wondering Huskey, That a nice table. Wonder if I could make a lamp out of an AK or some old gun to put on that table of yours. Thats really cool. The Royal Canadian Mounted Police Web site says I could have a real antique made before 1898. It would have to be a muzzleloader, matchlock, flintlock, or wheel lock long gun. I could not have a modern replica or a long gun with a barrel longer than 4 inches (105 mm). Does that mean an arquebus or musket? Antique hand guns and percussion cap guns are strictly prohibited. But the RCMP also says, “A firearm that discharges black powder cartridges might be considered an antique if it was made before 1898, but not necessarily. It would depend on the caliber or gauge. For example, a shotgun that discharges 12 gauge centre-fire cartridges would not be considered an antique no matter how old it is.” I realize something is better than nothing, but don’t they take a long time to load and tend to backfire? Is it worthwhile to get a real antique long gun? Your very welcome Pat, yes we have some weird laws here. One air rifle I have heard of is pretty powerful at 1200+ fps. A ballbat in a umbrella stand is not a ‘weapon’, just a handy place to store it. How can anyone complain?Start collecting antique swords and other medieval weapons. For more ‘range’ a couple of pieces of pipe that handily fit together with a pipecap, that a shotshell happens to fit within may be the cheapest and best answer. Not that I’m advocating anything illegal. Yeah it’s pretty simple to construct things that’ll go bang when you pull a trigger. Not going to go into detail for obvious reasons, but the information is out there (I believe I mentioned on here a while back a couple books on the subject). Anyway, anything that’s rather stout can be swung successfully at someone to take them out of the fight, but of course if they’re in your space, you’re also in theirs. To counteract that you’ll want to put distance between you. Laugh if you must, but I use a hockey stick for that, and if you’ve ever played hockey you know how much someone slashing you with the blade of the stick hurts. If you hit someone in the right spots you can take them down rather quick. Even stuff like wasp spray can help (or bear spray which has been used a lot by criminals here in Newfoundland as of late). Can’t fight if you can’t; See, Stand, or Breath. If you take out one of those three you should win. A trappers bible on Amazon is about $10 for the Kindle edition. “Camp Alarms” section has some good ideas. I am having issues with my Windows 8 opening my version. Amazon tells me I have the current issue but Windows will not open Kindle on my pc. Robin, I see another by the same publisher, called Mantrapping by Ragnar Benson, at http://www.paladin-press.com/product/Mantrapping. I wouldn’t want anything Silence of the Lambs style. I just wanted enough to hold the creeps shooting up drugs outside my window and destroying my property in the middle of the night until law enforcement arrives. Now I find out that’s illegal in Canada, too. Whirlibird, that first Charles Bronson video is perfect. That’s the kind of simple device we need. It would let my 10-year-old sleep at night. Keep a couple of good fire extinguisher’s handy, squirt em with the white stuff, hit em with the red can. There are any number of simple traps that can be made, the problem is that most are deadly or will wound and most places that is highly illegal. At least until shtf.